LENGTH X WIDTH X HEIGHT: 196.3 x 73.3 x 58.4 in. 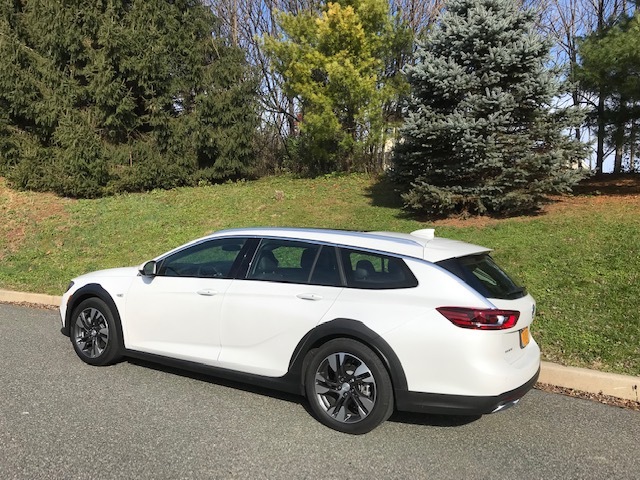 BOTTOM LINE: Unlike all the SUVs and CUVs on the market, the Buick Regal TourX is unabashedly a wagon, and therefore has more traditional styling and amenities. Several times during my week with the Buick Regal TourX, people asked me if it was an Audi. To be honest, it does resemble an Audi. And since the final assembly point is Russelheim, Germany, there’s perhaps a good reason for the resemblance. But no, this is a Buick, despite its build location. Part of the reason for the misconception is that Buick hasn’t built a wagon since the old “Roadmonster.” While not quite as large, the Regal TourX is more stylish, and built on a Regal platform rather than the larger sedan platform. One obvious difference is that there are no facing seats in the well by the rear hatch, but all the other goodies are there. Like cargo capacity. We found the cargo volume to be huge. It compares well with smaller SUVs, and you get the bonus of not driving a truck. Still, the TourX is still a Buick Regal at heart, with decent performance and conservative styling. Yes, my gray hair qualifies me as a Buick driver. The 2.0-liter turbocharged four offers more than enough power. When we wanted acceleration, or to merge into traffic from an on-ramp, we were score. Additionally, the TourX offered quiet operation. On the highway, or even around town, the Buick was essentially silent. Almost zero road noise intruded into the cabin, and this allowed us to keep the audio at senior citizen levels. Driver and passengers sit in a comfortable interior with issues. For example, the cupholders buried at the base of the center stack leave precious little room for taller cups. There’s another sure cupholder between the shifter and the console/arm rest, but cups rattle around in it. There’s a busy console with two USB, an SD card, plus a special adaptor for phones. But, if the phone rings, you have to open the console to answer it. We found the heating system to be very good in early winter weather. Heated seats help, and there are individual controls for the passengers. Front seats are comfortable. Hey, this is a Buick after all. Rear seats offer very good legroom and headroom, even with the extended sunroof. For rear passenger convenience, there are two USB outlets at the rear of the center console. A nice touch with then TourX is that a Buick logo lights up by the rear hatch when you unlock the doors with the fob. You can also unlock and raise the hatch by placing your foot under the rear bumper, and of all the versions of this facility, this is the easiest to operate that we have seen. The cargo area has four sliding tethers to tie down cargo if necessary. Rear seat backs lower by using buttons in the cargo area. There’s a clear instrument panel facing the driver. The information panel in the center can switch among a digital speedometer, or fuel information or vehicle data. I must confess to a built-in prejudice in favor of the Buick Regal TourX (we own a Buick and I like wagons), but the TourX is a superb package. Maybe you need wagon experience? But this is so much better than our Country Squire. Greg's take on the Nissan Kicks!!! 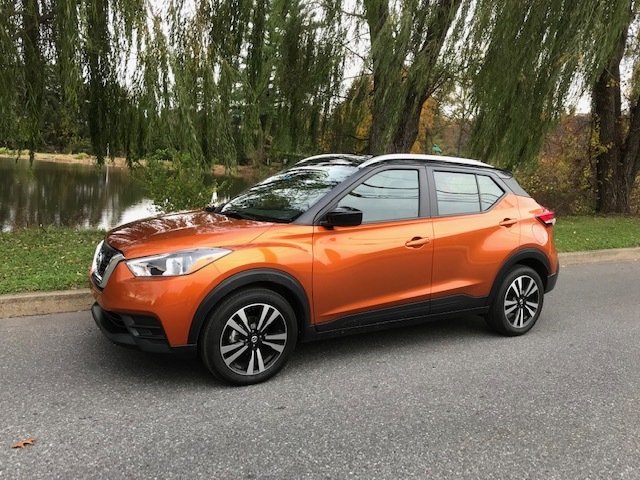 Just like every other major automotive manufacturer, Nissan is playing in the subcompact crossover segment with the Kicks. Bumper2Bumpertv looks at what the brand hopes will be their small but mighty competitor. HORSEPOWER/TORQUE: 125 hp @ 5,800 rpm/115 lb.-ft. @ 4,000 rpm. LENGTH X WIDTH X HEIGHT: 169.1 x 69.3 x 62.4 in. BOTTOM LINE: A worthy successor to the Nissan Juke, the Kicks incorporates all the good features of the Juke, including interesting styling, with a more modern approach. I have to confess, right off the block, that the Nissan Juke is/was one of my favorites. The styling knocks me out and the small-car performance is ideal for 90 percent of my driving. So when Nissan announced the demise of the Juke in favor of the Kicks (an equally odd name), I was concerned. Well, a lot of that concern is allayed. True, the styling isn’t quite as out-of-the-box as the Juke, but the Kicks still causes heads to turn whenever it passes by. It could have been tied Monarch Orange color with the black roof. Nissan calls the Kicks a City SUV and rightly so. The front-wheel-drive-only Kicks is small, built on a 103.1-inch wheelbase and only 169.1 inches long overall. I built my love of automobiles on small cars, so the Kicks fits in well, especially since an older small car has recently joined our stable. We drove the Kicks everywhere and felt confident. Sure, in some instances you have to anticipate (like on entry ramps) and plan ahead, but still, power is decent at 125 horsepower and 115 lb.-ft. of torque. The transmission is smooth, as with most CVTs. There is no jerky shifting. The driver faces a unique instrument panel. There’s a large speedometer on the right with (we chose from options) a large drive computer on the left with fuel economy, a digital clock and outside temperature on the top. Entertainment comes from a good audio system with easy-to-find sources and stations. Choices are among AM/FM, SiriusXM, Bluetooth and AUX with two basic knobs for adjusting. Yippee. A flat-bottomed wheel has the usual assortment of buttons for cruise control, audio, and scrolling through then information options. Up front there’s a nicely designed dash with a “carbon fiber” finish that goes well with the dotted seats and door rests. One feature that impressed me was the excellent HVAC system that was almost too warm. Like the audio, it has two simple knobs to control. Yippee two. Ahead of the shifter at the base of the center stack is a large cubby. There’s a small “key cubby” by the driver’s left knee. An additional smaller cubby is located between the shifter and the two cupholders, which are inconveniently located under the driver’s arm rest. There is no arm rest for the front passenger’s left arm, which my wife used to constantly remind me. Front seats are comfortable with good side support that invites brisk driving (if only there was a passenger arm rest). One of my favorite experiences is city driving a small car and weaving among the taxis. The cabbies aren’t too thrilled. Rear seats offer tight legroom, even with indents in the backs of the front seats. There is room for water bottles in the rear doors plus one cupholder at the rear of the center console. There’s good rear headroom and outside visibility. Cargo capacities are very good with the rear seat backs up or down. They did have to be folded for my golf bag. And with the seats folded there is a two-level cargo floor. Overall, the Kicks may not totally replace the Juke in my list of fun cars, but it does appeal with a slightly more conservative styling pallet and the kind of performance you want from a small SUV. This was the year for some high tech offerings and a growing number of fully electric vehicles at AutomobilityLA. Conspicuous by their absence were domestic nameplates Ford and General Motors. Bumper2Bumpertv has a look at some of the new models making debuts.